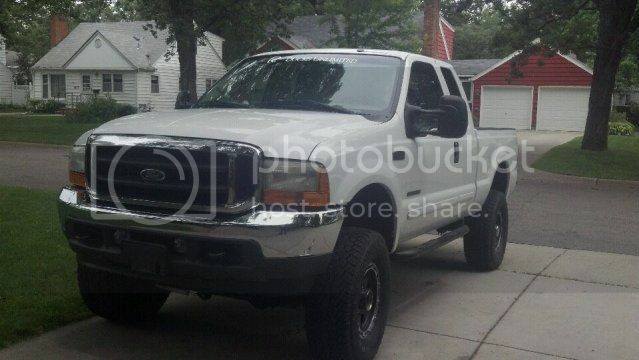 Going to take the plunge tonight and get a 2006 F350 with the *gasp* 6.0. It drives really nice and looks to be a good deal. Hoping the engine holds together and doesn't get hosed like you read about online. Can we talk about it here or is that blasphemous? No problem, we already talked about the Duramax. But then again, that is GM (sort of) so it was ok! Will up my household diesel count to 2 out of 3 cars, and my turbo count to 3 out of 3! Also of note, diesel by our place is cheaper than regular right now. Hoping to get some pictures maybe tonight or tomorrow, it's white and the King Rang crew cab, non extended bed. Looks real nice! Sounds like a nice truck. What problems did the 6.0 have? I thought those motors were alot better than the previous 7.2L? If you would believe the online forums, the 7.3l was the motor from jesus (and prices reflect this), and the 6.0 will grenade your head studs / gaskets, injectors, burn through oil coolers and EGR valves. When looking at 1999-2002 F250/350 with the 7.3, they are about $2-3k MORE expensive than a newer truck with less miles. Seems like most problems on the 6.0 come from tuning, and neglected maintenance. Thankfully I'm doing neither of those, let's hope the P.O. was the same way and the truck should be good. Diesel is .10 lower by my place than RUG, I am shocked. It has been more expensive for 4-5 years. The 6.0l was always more powerful than the 7.2, so maybe its the extra stress on the smaller engine that leads to the problems? I have owned a 97 F350 Reg Cab with the 7.3l, a 2000 F350 Ext Cab with a 7.3l, and a 2003 F350 Crew Cab King Ranch with the 6.0l. Bottom line... as they get newer they get quieter, nicer to ride in, more powerful, worse fuel milage, more problems. You can't go wrong with a 7.3l. They run forever and give you the least problems with the best mileage. Other than that stay away from the 6.0l due to injector problems and head gasket issues and poor fuel mileage, stay away from the 6.4l due to every problem under the sun and fuel mileage around 10mpg. I have heard nothing but good things about the new 6.7l but if you want to go throw $60k at a new truck your nuts! You will never get better than 14mpg in a 6.0. Plan on 10-12 around town. Also the 03 6.0l was the year with the most issues, pretty much gave the 6.0l a bad rap. ive owned 2 and loved both of them dearly. both however were tuned, and were very loud. there very nice trucks, just be sure to watch the headgaskets, and watch the egr from plugging up. I used to work for a company that ran a fleet of about 150 ford f250, 350, 450 and 550 diesels. They had quite a few problems with the 6.0L and 6.4L, but the problems seem to stem from driving them like a car. They need to actually work (i.e. pull loads) to keep them running well. If you don't get on the boost consistently the variable geometry turbos seem to stick... I would just suggest driving the hell out of it! I would just suggest driving the hell out of it! Just traded in my Gti for a 2001 f250 extended cab 7.3. I love it but i kinda miss my vw. any plans for it yet? Well, I had a bunch of bad experiences with the shop 6.0 a few years back- was only a couple years old. First, the intercooler exploded in northern CO, had to limp it back to denver. Then, it stranded me in wyoming, as an injector let go, and grenaded the motor on I-80. It was pretty much a train wreck situation. Think atom bomb. Stuck there for a week and a half. Put a new motor in, water pump let go in NM. All it ever did was pull a small covered trailer, with a porsche (either 356 or 911) in it, was bought new, no chips/flashes, and had under 40k on it. It may have been a fluke, and when it did run, did quite well. But, am always scared of complete engine failure on something that was not used hard, ever. But, I feel like if it hasnt happened yet, one with a few miles should be safe. Non euro driving, euro loving photog here!